14ymedio, Yoani Sanchez, Generation Y, Havana, 14 June 2018 –Three decades later, the woman is facing a familiar scene. A row of children dressed in their elementary school uniforms receive the new red scarf that replaces the blue one they had previously knotted around their necks. Like a déjà vu, she listens to her daughter repeat the same slogan she shouted out in her own childhood. The little girl, one knee on the ground, swears to follow the example of Ernesto Che Guevara, just like her mother had promised to do so long ago. To conclude the moment, the loudspeakers broadcast a song dedicated to Fidel Castro at full volume. “Louder, Louder!” the school principal shouts to the students, who must sing the boring tune verse by verse. “Louder, louder to be heard up there!,” he reiterates as he points to the sky, where, he believes, his Commander-in-Chief must have gone. 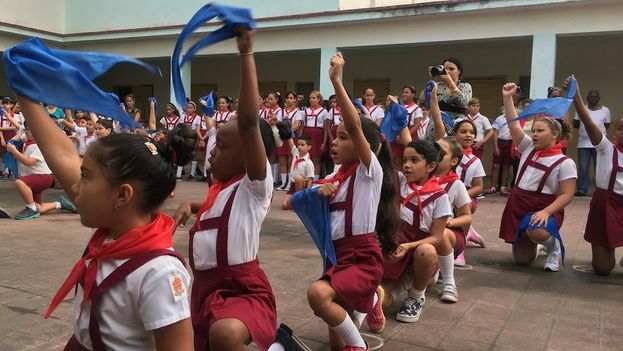 The music is over, the children shout the slogan that they will repeat in the coming years: “Pioneers for Communism, we will be like Che.” Then they leave the ranks and return to the unruly games of any child. The political “renewal of vows” is over. This entry was posted in Yoani Sánchez by Yoani-Sánchez. Bookmark the permalink.